Cherry Quartz is a man made pink glass, which is sometimes sold by less scrupulous sellers as a true Quartz. An interesting ‘gemstone’ – this ‘Quartz’ is actually a dyed, artificial glass. Many jewellers believed it was a true Quartz for many years, as it was sold as such. It is an attractive glass, to be fair – some of the pieces we have seen are gorgeous. 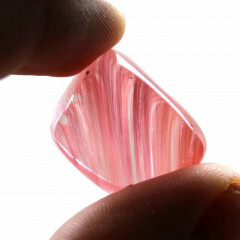 It is not to be confused with Strawberry Quartz, which is a real Quartz – however, this stone is extremely rare and this glass is often sold in its place. As it is a man made glass, it can only really be considered to have the properties of glass. Some may believe it has metaphysical attributes – we suppose if it calls to you, it is a stone for you.